Everyone is getting on the bandwagon with trying to estimate how many jobs will be created and lost in the aftermath of possible climate change legislation. Yesterday a panel of economists estimated 80,000 job losses in 2020. 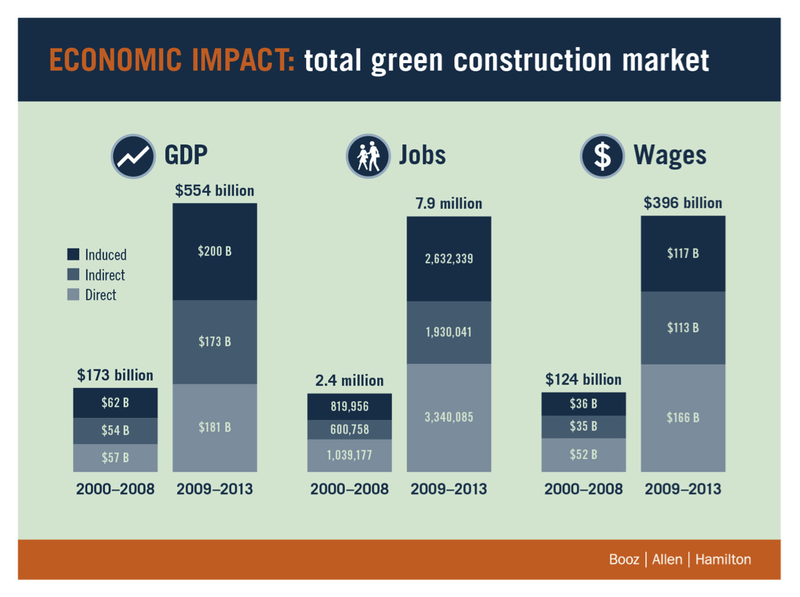 Today, the U.S. Green Building Council and Booz Allen jointly released a new report on green job creation. Their report based on construction levels since 2005 and salary data accumulated over the years, predicts that the green building industry will create (or support) 7.9 million jobs in the next four years amounting to $396 billion in wages. Below is a chart depicting their estimates against today's numbers. While the increase seems huge, it is customary for any growing industry. What will be more important is figuring out if this field might have any growth potential for you. Especially if you are actively looking for a job or want to change fields, this might be a successful switch. A former manager's advice comes to mind: "You always want to be a part of the money-making division in a company." The same applies to the economy: you always want to be in the field that is growing and guaranteed to succeed, not the one accustomed to booms and busts. Climate Change Legislation = Job Losses > Green Jobs?